Pohlman Reporting Company announced the acquisition of Evans Reporting Service, a provider of court reporting and related services in the Mid-Atlantic region of the United States. The announcement was made in a press release issued Feb. 12. If you missed the deadline for online registration to attend the only NCRA event designed exclusively for owners and managers of court reporting and captioning firms, on-site registration is still available. 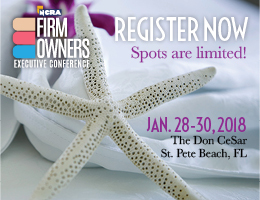 You can still take advantage of the opportunity to network with many of the profession’s top firm owners and managers in beautiful St. Pete Beach, Fla., at the NCRA Firm Owners Executive Conference, Jan. 28–31 at the Don CeSar hotel. On-site registration will be available in the foyer of the Grand Ballroom at the Don CeSar hotel all three days of the events, beginning Jan. 28, 3:30-7 p.m.
Attendees, including freelancers and owners of firms of all sizes, can expect an agenda rich with innovative, interactive, and inspiring sessions led by some of the best leaders in today’s business world. Keynote speaker John Spence, one of the top 100 business thought leaders in the nation, will share his insights into achieving business excellence. He will also present his most intensive business improvement workshop, specifically created to help management teams take a hard, honest look at their businesses to determine exactly what their strengths and weaknesses are. The workshop will also help participants create focused plans for how to succeed at a higher level in the marketplace. Watch Spence’s personal invitation to Firm Owners. Chris Hearing and Greg Laubach will present an interactive session entitled “Managing to Maximize Business Value.” The presentation will focus on creating short-term profits and business value so attendees can learn how to plan as if they will run their business forever but act as if they’ll sell it tomorrow. SEO strategist, internet marketing educator, and owner of the Tampa SEO Training Academy, Steve Scott will lead a session dedicated to business marketing on the Web. He will touch on the secrets to search engine optimization (SEO) success, tactics and techniques for online marketing, and social media marketing, among other topics. Numerous networking opportunities include the “Build-It, Mix-It, Who Will Win It” opening event, reception, and dinner, a networking power half-hour, free time during lunch, and a closing reception. Also on the schedule are educational events during breakfast sessions and a special welcome and meet-and-greet with NCRA’s new CEO and Executive Director Marcia Ferranto. The annual NCRA State of the Industry session will look at how the court reporting and captioning industry is doing now, what areas firms are developing, and what successes they’re finding – all based on solid, current data. 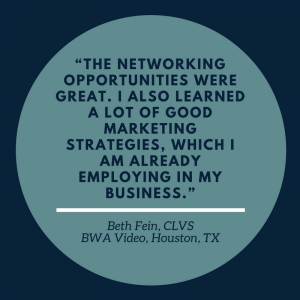 Having a real-world sense of what the industry looks like nationwide will help attendees know where their individual businesses fit into the big picture. Come join the 2018 NCRA Firm Owners Executive Conference this week and discover what connection or tip will be the one that makes 2018 your best business year yet, no matter what size your company may be. Update on the GOP tax plan: What’s in it, and how does it affect me? 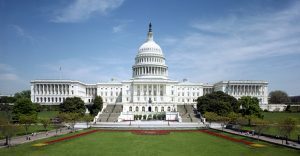 In the Dec. 13 issue of the JCR Weekly, NCRA’s Government Relations Department analyzed the tax reform legislation making its way through Congress. Since then, Congress passed its comprehensive tax reform package just before the end of the year. This update covers the final form of the legislation and how it will affect your wallets in the years to come. In the past 31 years, Congress has tinkered with and tweaked small components of the overall tax code but has failed to achieve comprehensive reform. With the passage of the Tax Cuts and Jobs Act, the Republican-led Congress has achieved one of its most coveted agenda items. The final version of the bill, signed by President Donald Trump, reduces individual tax rates across all seven brackets, reductions that expire after the year 2025. The highest tax rate is reduced from 39.6 percent to 37 percent, and the threshold at which the top rate kicks in is raised to $500,000 for individuals and $600,000 for married couples. This change brings significant tax breaks to wealthy taxpayers. The standard deduction is nearly doubled to $12,000, and personal exemptions are eliminated. Many other itemized deductions are affected by this legislation as well. State and local tax deductions are limited to $10,000, and medical expense deductions have been expanded by reducing the threshold to 7.5 percent of annual income. This deduction will be particularly important for low-income families with large medical expenses. Also, the new law doubles the child tax credit to $2,000, and it has a larger refundable portion that would allow more lower-income families to benefit. Benefits to middle-class Americans have been preserved in the bill, such as the student loan interest deduction and graduate student tuition waivers. This bill doesn’t make changes to retirement accounts like 401(k) plans. Concerning corporate taxes, the new law lowers the top corporate tax rate from 35 percent to 21 percent. This is the largest tax cut in the bill, the largest corporate tax rate cut in U.S. history, and the permanent rate of taxation for corporations. Business interest deductions would be capped at 30 percent of income. Pass-through entities get a 20 percent deduction of their income tax-free, changes that expire after 2025. The term pass-through companies refers to business income that is passed through to the business owner’s individual tax return. 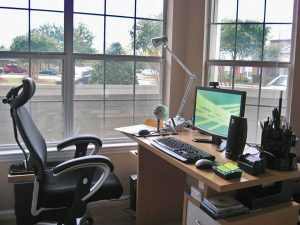 These companies include S corporations, LLCs, partnerships, and sole proprietorships. The new law also repeals, by 2019, the individual mandate penalty for purchasing health insurance created by the Affordable Care Act. Matt Barusch is NCRA’s Manager of State Government Relations. He can be reached at mbarusch@ncra.org. A trip to St. Pete Beach, Fla., in January to attend the 2018 NCRA Firm Owners Executive Conference makes the perfect gift for any freelancer or firm owner no matter what size the company. The deadline to register is Jan. 12 for this business-focused event that features opportunities for attendees to connect, learn, and energize as they network and join in stimulating and inspiring sessions. The event is Jan. 28-30 at the luxurious Don CeSar hotel. 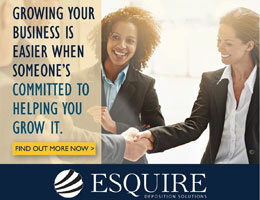 “I have attended the Firm Owners Executive Conference almost every year since its inception. The seminars and keynote speakers provide me with a wealth of practical information and industry insight that is both timely and essential to our business’s success,” said Lisa DiMonte, RDR, CMRS, a freelance court reporter and CEO of Planet Depos in Washington, D.C.
“I am particularly excited about this year’s keynote speaker, John Spence. His reputation as a successful business leader and executive coach precedes him, and I believe we will gain valuable knowledge from him that will help propel our business into the next level of achievement and growth. I look forward to reconnecting with old friends and meeting new ones at this year’s conference in beautiful St. Pete Beach,” she added. The 2018 agenda features an array of innovative and interactive sessions led by some of the best leaders in today’s business world. Keynote speaker John Spence, one of the top 100 business thought leaders in the nation, will share his insights into achieving business excellence. He will also present his most intensive business improvement workshop, specifically created to help management teams take a hard, honest look at their business to determine exactly where their strengths and weaknesses are. The workshop will also help participants create a focused plan for how to succeed at a higher level in the marketplace. View Spence’s personal invitation to Firm Owners. Chris Hearing and Greg Laubach will present “Managing to Maximize Business Value.” The presentation will focus on creating short-term profits and business value so attendees can learn how to plan as if they will run their business forever but act as if they’ll sell it tomorrow. 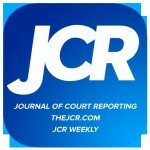 The annual NCRA State of the Industry session will look at how the court reporting and captioning industry is doing now, what areas firms are developing, and what successes they are finding – all based on solid, current data. Having a real-world sense of what the industry looks like nationwide will help attendees know where their individual businesses fit into the big picture. Numerous networking opportunities include the “Build-It, Mix-It, Who Will Win It” opening event that will lead into dinner, a networking power half hour, free time during lunch, and a closing reception. Also on the schedule are education events during breakfast sessions and a special welcome and meet-and-greet with NCRA’s new CEO and Executive Director Marcia Ferranto. Register now for the 2018 NCRA Firm Owners Executive Conference in January and discover what connection or tip will be the one that makes 2018 your best business year yet, no matter what size your company may be. Special hotel rates for the event will also expire on Jan. 5. The GOP tax plan: What’s in it, and how does it affect me? For the first time in decades, Congress appears to be on the verge of comprehensively reforming the U.S. tax system. In the past 31 years, Congress (regardless of the party in power) has tinkered with and tweaked small components of the overall tax code but has failed to achieve comprehensive reform. For the last few weeks, the Republican-led Congress’ focus has been on simplifying the tax code and cutting taxes with the intent to spur economic growth. The House of Representatives and the Senate have each passed their own version of tax reform packages, dubbed the Tax Cuts and Jobs Act. The two bills will now meet in conference committee to reconcile their differences and produce a final product to send to President Trump’s desk. But what is in those bills? What is most likely to be included in the final product? How will this affect me and how much will I pay in taxes? NCRA’s Government Relations Department has been hard at work analyzing the different tax bills, and here is a breakdown of what is in these bills. Let’s start with the commonalities: provisions included in both the House and Senate bills. Both bills lower individual income tax rates and reduce the corporate income tax rate from 35 percent to 20 percent. These changes are intended to allow corporations to re-invest in their business infrastructures and hire more workers. Both bills also double the current estate tax exemption for individuals to $11 million, which the House bill repeals in 2024 and the Senate bill makes permanent. With the intent of simplifying the tax code, the House bill eliminates most tax deductions in favor of doubling the standard deduction. The House bill also collapses the current seven-bracket classification system to four and eliminates many itemized deductions. State and local taxes (as well as medical, business, and classroom expenses) will no longer be deductible. These deductions were eliminated in favor of the higher standard deduction. The Senate bill maintains the current seven individual brackets but lowers the effective rates and changes the income levels to which they apply. This changes after 2025, when the bracket reverts to current law. You can see how the tax brackets break down for single and joint filers in both bills here. The Senate bill also gets rid of the individual mandate penalty for purchasing health insurance created by the Affordable Care Act, one of the main reasons for tax reform in the Republicans’ minds. The House bill increases the federal deficit by $1.08 trillion over the next 10 years, according to the Tax Foundation. While there are a lot of moving parts in these bills, nothing is set in stone, and NCRA and our lobbying team are monitoring these events and speaking with our friends on Capitol Hill. You are encouraged to do the same! It is important for your elected officials to hear from you on your opinions. 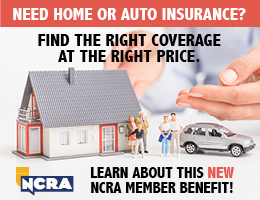 Contact them to let them know how this bill affects you and your family. For more information on how to reach out to your elected officials, contact NCRA’s Government Relations Department at GovRelations@ncra.org. Matt Barusch is NCRA’s Manager of State Government Relations. He can be reached at mbarusch@ncra.org. Dave Wenhold, CAE, PLC, is NCRA’s legislative counsel. An Oct. 25 blog post from Depo International focuses on time-saving tips for business owners, including subtracting rather than adding to the daily to-do list, keeping things simple, and prioritizing. From my heart: It is a privilege to serve you!